Description CAPPUCCINO FROST METALLIC exterior and INT TRIM LIGHT NEUTRAL interior, Rendezvous trim. EPA 27 MPG Hwy/18 MPG City! PRICED TO MOVE $200 below NADA Retail! Sunroof, TRANSMISSION, 4-SPEED AUTOMATIC, ELEC. CD Player, SEAT ADJUSTER, POWER, DRIVER 6-WAY, SUNROOF, POWER, TILT-SLIDING, ENGINE, 3.4L 3400 V6 SFI (185 HP [138. 4 Star Passenger Front Crash Rating. CLICK ME! CD Player. Keyless Entry, Privacy Glass, Child Safety Locks, 4-Wheel Disc Brakes, Vehicle Anti-Theft System. includes sunshade, ELECTRONICALLY CONTROLLED WITH OVERDRIVE (STD), 3.4L 3400 V6 SFI (185 HP [138.0 KW] @ 5200 RPM, 210 LB.-FT. [283.5 N-M] @ 4000 RPM) (STD). 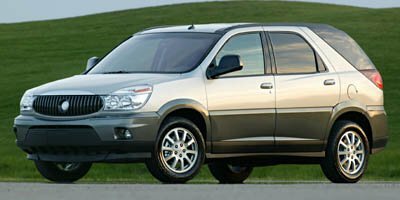 Buick Rendezvous with CAPPUCCINO FROST METALLIC exterior and INT TRIM LIGHT NEUTRAL interior features a V6 Cylinder Engine with 185 HP at 5200 RPM*. Edmunds.com explains "With its comfortable seating, sound ergonomics, generous storage and admirable fuel efficiency, the Rendezvous is a decent choice for a family vehicle.". Great Gas Mileage: 27 MPG Hwy. This Rendezvous is priced $200 below NADA Retail.